Corey Christiansen grew up in a musical family. 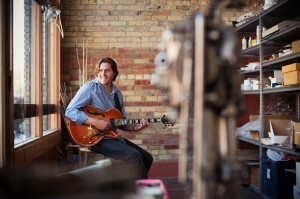 His father, Mike Christiansen, started teaching him guitar at the age of five. Corey spent a lot of his youth learning the guitar and music. After high school, Corey received his bachelor’s degree from USU. A year later Corey left for Tampa Florida to study with legendary jazz guitar educator, Jack Petersen. In 1999, Corey received his master’s degree from the University of South Florida and took over the teaching duties of Jack Petersen the next year. From 2000 to 2007 Corey was the senior editor and guitar clinician for Mel Bay Publications. This job allowed him to tour, give clinics, develop products, produce recordings and rub shoulders with the best musicians in the business. Corey has presented countless clinics and performances around the world and developed a fan base not only for his teaching but his playing. “Awakening,” Corey’s first CD as a leader, was the initial release on Mel Bay Records, the entertainment-recording division of Mel Bay Publications. Awakening spent twelve weeks on the JazzWeek chart, reaching number 16 in March 2005. The title track, an original composition, consistently receives the most airplay from the recording. MB3: Jazz Hits Vol. 1 marked a great leap in his national and international visibility as a player and producer. Teaming with an all-star band featuring fellow guitarists Vic Juris and Jimmy Bruno and being backed by legendary drummer Danny Gottlieb and first-call NY bassist, Jay Anderson, Jazz Hits Vol. 1 spent three weeks as the No. 1 jazz recording on North American jazz radio. 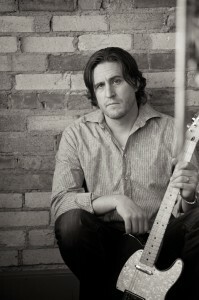 In 2007 Corey moved back to his native Utah and was the Director of Curriculum for The Music School, a privately funded music program outside of Salt Lake City. During this time he continued an extremely active touring schedule playing all over the US and into Europe. In the fall of 2007 Corey signed with Origin Records by the end of Feb. 2008 had two records ready for release. Laden with hooks and grooves, Roll With It is Corey’s debut release for Origin and features Matt Jorgensen on drums, Pat Bianchi on organ and David Halliday on sax. This critically acclaimed recording proved Corey was formidable player, arranger and composer. C. Michael Bailey of All About Jazz reviewed the CD stating that “Corey Christiansen has arrived with one of the most satisfying soul-jazz recordings of the year.” In May of 2010 his second offering for Origin Records, Outlaw Tractor, was released also to critical acclaim. His music draws on the tradition of the masters but leans towards the future. Rooted in the tradition of the jazz language but just bluesy and gritty enough to not alienate larger audiences. Corey’s current music follows his first two recordings proving he has the ability to keep the artistic integrity of the music without pushing listeners away. Corey is becoming recognized as one of the preeminent jazz guitarists in the world. In the fall of 2008 Corey assumed duties teaching at Utah State University and the famed Jacobs School of Music at Indiana University. Because of his life in the music business he brings a “real world” environment to the classroom. Even with a busy academic schedule, Corey still tours and continues to record. This professional experience enhances his teaching as he is able to bring real-world experiences to his students. He is also an artist-in-residence at Atlanta Institute of Music (Atlanta, GA), and Broadway Music School (Denver, CO). Corey Christiansen has a number of publications with Mel Bay and has conducted countless guitar clinics and concerts across the country and beyond including Europe, South Africa and Australia. He has also performed at many notable festivals and venues including John Pisano’s Guitar Night in Los Angeles, the Smithsonian Institution in Washington, D.C., the Umbria Jazz Festival in Perugia, Italy, the Lionel Hampton Jazz Festival, the Clearwater Jazz Festival, the Monterey Next Generation Festival, the Daytona Beach Jazz Festival, the Syracuse Jazz Festival, the Park City Jazz Festival, and the St. Louis Jazz Festival. He has also performed and/or recorded with many outstanding jazz artists including James Moody, Jeff Coffin, John Benitez, Terreon Gully, Steve Davis, Eric Alexander, Matt Jorgensen, Byron Stripling, Jeff Hamilton, Alan Pasqua, Randy Brecker, Jeff Coffin, Peter Erskine, John Pisano, Willie Akins, Dr. Lonnie Smith, Jim White, Steve Houghton, Steve Allee, Pat Harbison, Jack Wilkins, Ambrose Akinmusire, Ed Soph, Jim White, Christian McBride, Keyon Harrold, George Duke, Terri Lyne Carrington, John Riley, Dave Pietro, Danny Gottlieb, and many, many others.